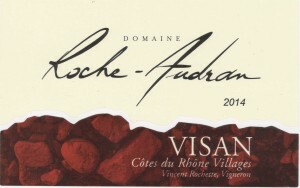 Domaine Roche-Audran is a bio-dynamic winery situated in natural wooded preserve at the foot of the Buisson vineyard. Winemaker Vincent Rochette created the domaine in 1998, however his family had been working the land for 5 generations. The winery has been biodynamic since 2006. Blend : Grenache, 60% Syrah 40%. Area, yield and age of the vineyard : 7,5 ha, 35 hl /ha, 60 years. Terroir : VISAN This vineyard, which originally belonged to my grandmother, is located to the west of the village of Visan, at an altitude of 140 meters in the heart of the garrigue. The soil origins date from the alluvial terraces of the Würmian period in the fourth ice age of the Quaternary period, 80000 years ago. It is very arid and composed of more 60% stones. The vines are surrounded by natural vegetation including green oaks, white and clematis, dogwood, hawthorn, thyme, madder ... Aromas and serving temperature : Vibrant black cherry color. Nose of red and black berries (blackcurrant and blackcurrant buds), with hints of violet. Full, silky and fresh on the pallet : a definite aroma of blackcurrant with a note of white pepper. A long and refreshing finish of delicious black fruits. This wine typifies the région and is an excellent pairing with meat and fish. Drink well now and can be kept for 4-5 years. Serve to 17° C. Cultivation : Biodynamic cultivation : in order to give emphasis to respect for nature, our vineyards are maintained by regular tilling and by using natural treatments, with no synthetic products, thus maximizing the full expression of the terroir. Vinification and ageing : Coach plot is vilified and aged separately in order to preserve its individual character. True to our policy, we employ no chemical additives; only sulphur is used, and in moderation. Locally-Preset yeasts contribute all aromas of the terroir during alcoholic fermentation, and remontage, pipeage or delestage. Daily tasting takes place throughout the process to ensure production of wines that are both balances and complex. After 6 months aging in concrete vats, our red Côtes du Rhône Villages Visan is bottled very young, in Spring to preserve its freshness and the full flavor of its fruit.